It’s the time of year when, for an instant, sports fans everywhere can pause from their busy lives and take a breath. As students, we forget about our SAT’s, our midterms, and our term papers. Politicians, like President Obama, forget about drudging on with foreign affairs and health-care policies, because for a moment, we all get to enjoy America’s greatest pastime: sports. And no sporting event is more American than March Madness. March Madness—the NCAA actually paid over $17 million for sole ownership of the term—is the post-season tournament that determines the national collegiate basketball champion . Every year for a little over two weeks, it receives national attention as the dominant sporting event in the nation. But why do people make such a huge deal over March Madness? Well, it includes sixty-eight of the most elite collegiate programs from across the nation in a single-elimination bracket, meaning free-for-all, winner-takes-everything. Thousands upon thousands of fans fill out brackets predicting each game’s outcome and enter them into personal betting pools, or this year into Warren Buffet’s $1 Billion Bracket Challenge, where any perfect bracket wins $1billion. With this set-up, we receive reliable drama year after year from the unpredictable matchups. With over 60 games played there are bound to be upsets and heartbreaks every year, and the 2014 tournament has proven to be particularly eventful. In the first round alone, we have seen five overtime games, a record in the tournament’s long history. There have also been a number of upsets, or “bracket busters” as fans like to call them. We have witnessed the fall of Duke, the almighty powerhouse year after year, to the #14 ranked Mercer Bears, as well as the fall of #1 ranked Wichita State to #8 Kentucky. These, combined with the 10 other upsets, have already eliminated every bracket from the Warren Buffet Challenge, just over halfway through the tournament. San Diego State has had a rough tournament. Offensively they have a limited scoring threat in Xavier Thames. They have struggled, shooting only 39% and 42% in their games and nearly blowing a 14-point lead over 13th-seeded New Mexico State. Meanwhile, the Wild Cats have been rolling for some time. Coming off a 23-point win, they have a very athletic and versatile front court and defensive presence as well as a dual-scoring threat in Aaron Gordon and Rondae Hollis-Jefferson. They have the championship package and are my favorite to win it all. #2-ranked Wisconsin may have been a little overhyped coming into the tournament. They were lucky to come from behind and beat Oregon, and in a tournament where defense is everything, theirs has been questionable. Meanwhile, Baylor has been impressive in rolling past Nebraska and Creighton under the leadership of Scott Drew. They have a solid paint presence in Cory Jefferson and Isaiah Austin and I don’t see Wisconsin having a good offensive night. Kentucky is HOT! Coming off an upset of #1 Wichita State, this team looks better than ever. Despite the general lack of NCAA-tournament experience, this team has shown tremendous chemistry and has rallied behind star Julius Randle. Louisville has potential to be a very good team; however, March Madness is all about how you play in the moment, and I don’t think Louisville is versatile enough yet to face hot teams like Kentucky or Arizona. This one is a toss-up for me. Despite their big wins, neither team is playing particularly well, but neither is necessarily bad. I am picking Tennessee because they have had more momentum in their wins over Mercer and Massachusetts, while Michigan State’s offense has been unable to take care of the basketball, a deal breaker this late in the year. UCLA is a solid, well-rounded team. They are strong in every position and have had a good tournament. Unfortunately for them, Florida is a monster. Despite one of the toughest schedules, they have not lost a game since they faced Connecticut on December 2nd. I’ll let that fact speak for itself. The least predicted match-up of all, but that’s why we love March Madness. I mean, an overall #34 or #44 seed is going to make it to the Elite Eight? You have to love it. Both teams have been clutch this postseason, with the largest margin of victory coming from Stanford at just 5 points over New Mexico. Dayton is balanced, but not spectacular in a single area, while Stanford has a dynamic frontcourt duo in Chasson Randle and Dwight Powell. This will be a good game, but I am going with Stanford. Michigan can be a dangerous team. They shot nearly 47% from three-point land thus far in the tournament, but relying to heavily on the three is a very dangerous thing to do deep in the tournament, especially against a strong defensive team like Virginia. Virginia had a little scare against #16 Coastal Carolina, but they bounced back with a decisive 18-point victory over Memphis. They have a lot of scoring threats and a strong defense, a combo that can take them all the way. Iowa is another team that has relied heavily on the three-pointer, shooting nearly 49% in the tournament, to barely squeak past North Carolina . And when you combine their 23 turnovers with Connecticut’s high-pressure offense and a hot star in Shabazz Napier, you come out with a Connecticut victory. As the upsets thus far have shown, nothing is for sure, and my picks may be just as accurate or inaccurate as anyone’s. But that’s what makes March Madness great. 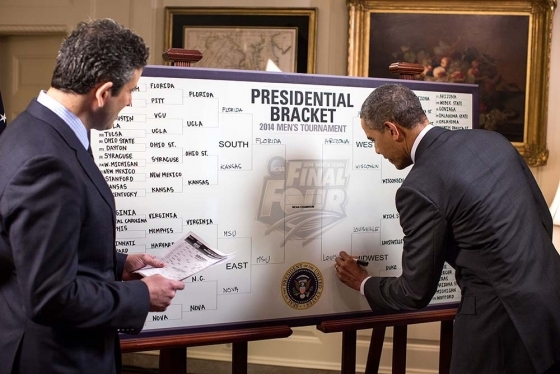 Experts may come out with awful brackets and the grandma in your local pool may have a great one. You never know. Year after year it’s unpredictable. It’s exciting. It’s the Big Dance. You can catch the Sweet Sixteen action on your local stations between March 27 and 28.